Journal of Private and Commercial Law (JPCL) is a scientific journal for the fields of Private and Commercial Law and allied sciences with Private and Commercial Law. 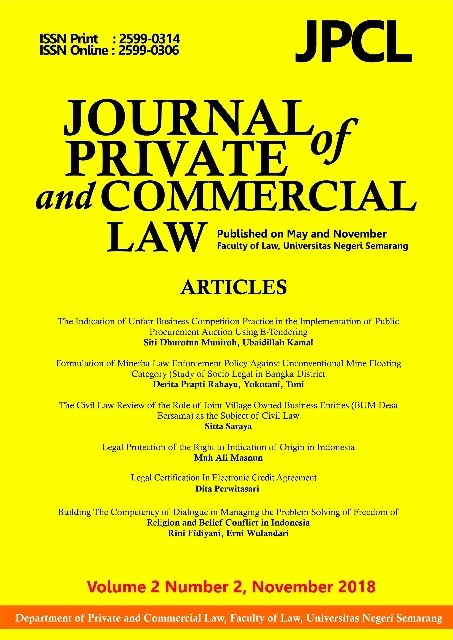 JPCL was published by Department of Private and Commercial Law, Faculty of Law, Universitas Negeri Semarang. Journal of Private and Commercial Law (JPCL) receives articles based on research results and thoughts in Private and Commercial Law field, you can find our scope in FOCUS AND SCOPE. JPCL accepts writing in English. JPCL is published twice a year (Semi-Annually) in May and November. The article will go through a peer review process and ensuring a blind peer review process. Based on the review will determine whether the manuscript will be published or not. JPCL is a media to bring together the results of thought and research by academics and practitioners in selected legal fields of study covering Private Law, Commercial Law, Intellectual Property, Economic Law, Business Law, Adat Law, Anthropology Law, Sharia Law, Insurance Law, Banking Law, Consumer Protection Law, and cognate in other Private Law fields. The manuscript that has been received and is ready to be published will be published online (OJS) and the printed version. We are happy to give announcement to all of you that all of the published articles in JPCL is already in Microsoft Academic Search. Dear JPCL Authors, you can find your article there. we are proudly giving an announcement to all of you that JPCL already signed the contract with Hein Online. We are gladly giving an announcement to all of you that JPCL is already indexed in Indonesia One Search (IOS) by PERPUSNAS.